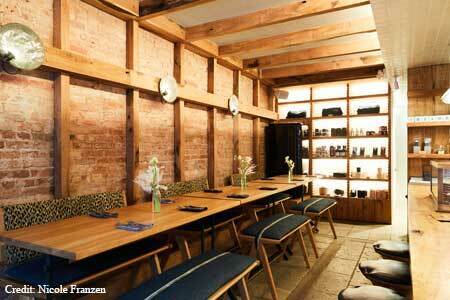 Airy, California-cool all-day café in SoHo with a seasonal veggie-centric menu. About the restaurant & décor: This California-inspired all-day café in SoHo exudes understated downtown cool. Owner Camilla Marcus comes from LA, and she has decorated the airy, small space with wooden communal tables, a counter with stools, and a nook full of throw pillows. Exposed brick walls, reclaimed wooden ceiling beams, and a fridge full of fresh-pressed juice and rosé make West-bourne a comfortable, lovely spot. Likes: “Mushreuben”; “Bay Cities Cauli”; pretty space. Dislikes: Small spot is often packed; all-vegetarian menu is not for everyone. Food & Drinks: Start with “Over the Rainbowl,” an accurately named bowl of colorful pickled and raw cucumbers, radishes, carrots and cauliflower served with lentil falafel and creamy green tahini dressing. Chef Amy Yi (formerly of Upland and Jean-Georges) takes the ubiquitous bowl trend to new levels --- the “Bay Cities Cauli” with cauliflower and sheep’s milk cheese, and the “Sunset Grains,” local grains with almond butter, maitake mushrooms, kale and chili oil are proof. The “Mushreuben,” a veggie take on a Reuben stuffed with mushrooms, Swiss cheese and special sauce, is wonderfully decadent considering its meatlessness. For dessert, good luck deciding between silky avocado vanilla panna cotta and dark chocolate cashew pudding. You could always get both. Did we mention this is a veggie restaurant? 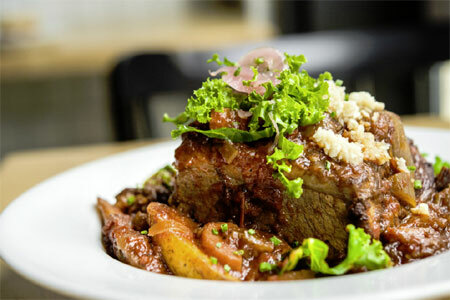 It also focuses on local, seasonal and sustainable food, and a portion of all proceeds goes toward a New York non-profit dedicated to youth empowerment. The wine list includes a large selection of varieties from California.